This granola is like eating candy, it is so delicious. It is also packed full of good grains/seeds and natural immune strengthening honey. Enjoy it plain as a snack, or warm or cold with milk. Measurements are approximate, feel free to indulge in creative dumping. 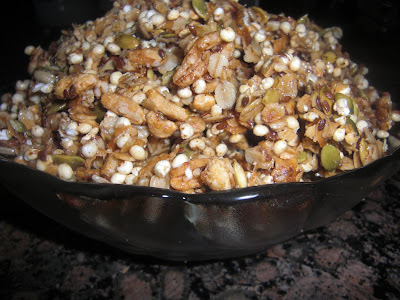 For info about these grains, if they sound a bit crazy check out my whole grain post. Raisins, blueberries, cranberries, apricots, dried apples. My favorite is dried apples. *All these ingredients should be available at your local health food store. Pour warm mixture over oat mixture and stir until moistened. Line 3 cookies sheets with parchment paper. Spread mixture evenly on sheets. Bake at 350 degrees for 15-25 minutes until just golden (do not overcook). Stir occasionally. Remove from oven and cool. Store in an air tight container. Hi Rebecca! So, I am just loving all of these recipes you post. I made the brussel sprouts for dinner tonight and my husband said they were the best vegetable he had ever eaten~ kudos! My son loved the apple/banana pancakes too. I just got all of the stuff to make the choco cookies and tootsie rolls. We are anxious to try them! Oh yeah- did the potpourri the other day too when we had company and they all loved it. Thanks so much for all of the great ideas! PS- Just started reading "Sugar Blues".... very interesting!